When armed gunmen took hostages in separate location in France, some people responded with miraculous courage and quick instincts: from an employee texting police beneath a sink to a father who hid his son in the fridge and so saved his life. Friday’s events played out at two separate locations. The first one was inside a printing works in Dammartin-en-Goele, 50 kilometers from Paris, where the shooters in the Charlie Hebdo massacre, Cherif and Said Kouachi, were found. The Kouachi brothers were surrounded and reportedly opened machine gun fire at police. One hostage was believed to be taken by the suspects – 26-year-old Lilian, an employee at the printers. Lilian hid “under a sink in the canteen” upstairs and the gunman had no idea he was there. He managed to tip the police off with some valuable "tactical info such as his location inside the premises," a source told AFP. “I hid on the first floor. I think they killed everyone. Tell the police to intervene,” he texted his father Le Figaro reported. After security forces stormed the building, killing both gunmen, Lilian was taken to police headquarters, where he was quickly reunited with his family. The courageous employee was "shocked" but "OK", media said. 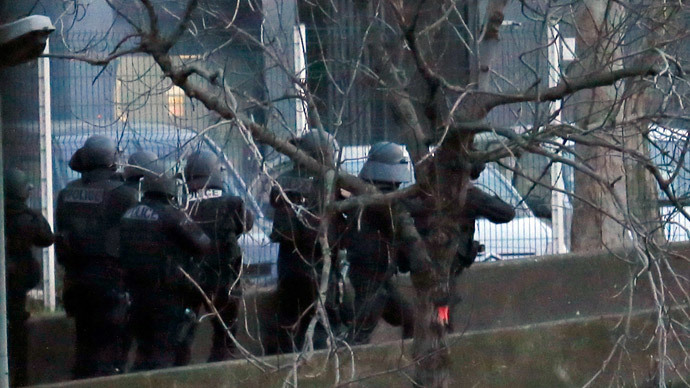 Another “quick instinct” incident happened in the Porte de Vincennes area in Paris, where a Kouachi-linked gunman named Amedy Coulibaly took hostages at a kosher grocery store. The gunman immediately killed four hostages the moment he entered the store. A father named Ilan in his thirties was among the hostages taken by Coulibaly together with his 3-year-old son. To save the toddler’s life Ilan acted quickly and without hesitation – he hid himself and the son in the supermarket’s refrigerator, two relatives told AFP. Ilan removed his jacket to protect the boy from the freezing temperatures. At least three other people also managed to hide in the fridge with the father and son, sources close to investigation said. The hostages spent five long hours waiting for rescuers. Ilan’s mother somehow understood that her son and grandson hid from the assailant. She decided not to text Ilan fearing the attacker might hear the message. The woman gave his phone details to police so that they would track his location as well as the location of other hostages in the store. Coulibaly’s partner and alleged accomplice, Hayat Boumeddiene, has been put on the police wanted list and is currently at large. She is believed to be armed. Boumeddiene had exchanged about 500 phone calls with a companion of one of the Kouachi brothers, according to authorities.